Anemic Compass introduces a new body of work in which Steve Reber considers the high-performance vehicle as a multi-layered point of departure for examining American culture. The exhibition will feature the large sculpture Auto Mending; a full-scale model of an automobile that is stripped down and modified. The girth of the vehicle is absent, while the open structure of the work carries the footprint of factory standardization. The sculpture’s dimensions and cast tires give the viewer clues as to its origins, yet Reber deviates and injects elements such as printed fabric, window screening, and denim, which weaves domestic concepts. Steve Reber was selected to participate in the 2019 exhibition program through the Art Center’s submission process. Submissions are periodically reviewed by the Exhibitions Committee, which consists of artists, curators, critics, and Art Center staff. The Art Center welcomes submissions of artists’ work and curatorial proposals for group exhibitions on a rolling basis through our website. Steve Reber (b. 1958) lives and works in Chicago, where he has been a faculty member at the School of the Art Institute of Chicago since 1998. He received his MFA from The Maryland Institute college of Art and a BS from Nazareth College of Rochester. 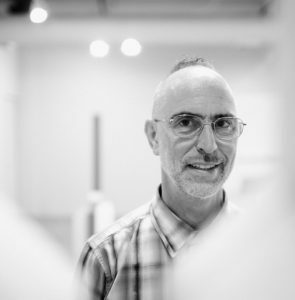 His work has been exhibited at numerous Chicago venues, and institutions including the Chicago Cultural Center, Three Walls, Sullivan Galleries SAIC, and the Illinois State Museum. His work was recently included in the Dock 6 Design and Art series, and in 2016 he presented a solo exhibition at Devening Projects. Earlier this year, his work was exhibited at Hobart and William Smith College Solarium Gallery, Geneva, NY. He was the recipient of an Artadia grant in 2006 and Illinois Arts Council grants in 2006 and 2000.